Madison Hildebrand, President and Founder of The Malibu Life, Inc., is one of the most recognizable faces in the world of real estate. As an esteemed and respected luxury real estate agent, Madison is a consummate professional and negotiating expert, with over $300 million in career sales. After completing his Bachelor of Arts in Advertising from Pepperdine University, Madison became a pillar within the Malibu community. He serves as a current Board Member of the Malibu Boys and Girls Club, a past Board Director of the Malibu Association of Realtors, a weekly volunteer at the ER at the UCLA Santa Monica Hospital, and Vice President of The Malibu Green Machine. A six-year veteran of the small screen, Madison is most widely known as the original cast member of Bravo's popular television series "Million Dollar Listing Los Angeles" and as a contributing host on "E! News." His most recent accomplishments include signing on as Brand Ambassador for the eSignature company, DocuSign, as well as producing a national seminar tour where he coaches realtors across the country on creating their own personal and professional blueprint for success. Whether it's gardening, traveling, or hiking with his rescue Doberman, Maya, Madison lives by his philosophy, "You can mix business with pleasure." 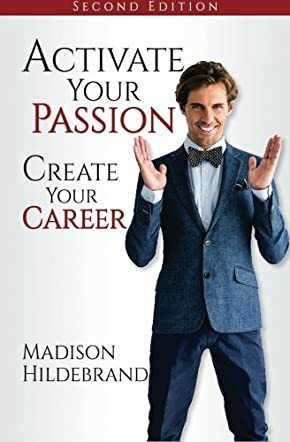 Activate Your Passion, Create Your Career by Madison Hildebrand is a powerful memoir/self-help/how-to guide. Most people know Madison as the handsome and sweet Real Estate Broker on Bravo TV’s “Million Dollar Listing Los Angeles”, but what you may not know is included in the book. People who are ultra-successful usually have stumbled a few times to get to the top and Madison is no different. He describes his journey with painstaking honesty and shows a courageous side to growing up in the shadow of over-achieving parents. If you loved Madison before reading his book, you will love him even more afterwards for being real about how hard it is to make it as a top sales person while being a recovering addict. The theme is finding your passion and clearly, Madison found his. His eyes light up at the thought of connecting with others, helping them find one of the most important purchases we make in our entire lives, and building lasting relationships. Though he works in glamorous Malibu, there is something so down to earth about him that anyone would want to hire him. In the book, he explains how tough it is to start out in a big office with no experience or contacts and sell an expensive property, beating a whole lot of shark agents. He gives personal examples and wisdom from experience about real estate, although this book is more of an inspirational guide for anyone. Activate Your Passion, Create Your Career by Madison Hildebrand offers motivation to find the joy and follow that path, no matter what it is. It is never too late to change careers, to get sober, or to have the best adult life possible, even after growing up as a lonely kid.